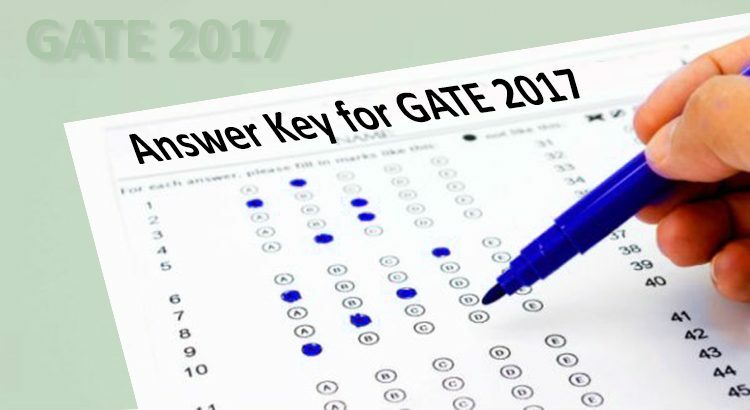 The answer key for GATE 2017 exam will be released on 27 February by the organizing body of GATE 2017 exam IIT Roorkee. The exams were conducted on four different dates i.e. 4-5 Feb 2017 and 11-12 Feb 2017 for 23 different disciplines of Engineering and Science. The answer keys for all the branches will be displayed on the official website gate.iitr.ernet.in. If a candidate is not satisfied with the GATE 2017 answer key and wishes to challenge it, he or she can do so in between 3-6 March 2017. A candidate cannot challenge the GATE 2017 answer key after 6 March, 2017. In our earlier notification, we speculated that the answer key for GATE 2017 will be released within a few days after the exam. However, as per the official notification on the GATE official website says that the answer key for GATE 2017 will be released on 27 February 2017. The official GATE 2017 answer key will help a candidate in calculating the GATE score. It will also help you in finding out whether the candidate will be able to satisfy the GATE 2017 cut off marks or not. The GATE scoreis accepted by many PSUs such as GAIL, BPCL, BSNL, IOCL etc. for the purpose of recruitment. Candidates looking forward for any PSU recruitment can also use the GATE 2017 answer key to know about the cut off for PSU recruitments. The final results for GATE 2017 will be declared by IIT Roorkee on 27 March, 2017. To download the official GATE 2017 Answer Key, you will have to check the session you have appeared for, and then click on the link given next to the GATE Paper and session. A PDF file will open in a new browser from where you can click on either the ‘Download’ or ‘Save’ button to download and save the answer key file. If you wish to get the answer key with most accurate solution for each question, then you can visit the website of IES Master as there you can find the same. To download the Answer Key for GATE 2017 along with solutions prepared by IES Master for each branch from HERE.